Trash left behind from Alive. It’s all along Magnolia and Mimosa. The city needs to buy and place trash cans along Magnolia, Atlanta St and Mimosa Blvd to help with this ongoing problem. The Shell Station is a disgrace and yes it’s has a lot of foot traffic BUT if there were trash cans and the owner took responsibility every day to clean up the property, it wouldn’t be an issue. The city needs to spend our tax dollars this way vs providing city property and port o potties for day workers who most likely are NOT even Tax paying citizens of Roswell or this country! The on going problem is humans. How about humans beings (adults) take some self responsibility and take the trash with them and dispose of it instead of leaving it on the ground. Why don’t you place the blame on humans and their selfishness. Stop blaming the government for not doing something. Blame the adults for leaving the trash. There are more than enough trash cans within the event. Why can’t ADULTS have enough common sense to dispose of their trash prior to leaving the event. You place a lot of blame on the city with the numerous requests you make around that area. I am glad that you assume the day labors are illegal. Are you basing that on their ethnicity? Those are probably the same day laborers that are hired to repair something at your house. When they go to the store, are they not paying taxes on the goods they purchase which go into the economy? There is a lot of trash along Azalea Drive (the river side ) in the right of way and adjacent to the path, basically from Hwy 9 to Willeo including broken glass (near the boardwalk entrance that crosses to Willeo). Are there any planned cleanups? I picked up 3 outdoor trash bags of trash in early April on edge and in walkable muddy bank when water level was low. Thank you! I hope the city will continue to monitor this area as it frequently has litter along both sides of the road. Streetlight out at 270 Steeple Pointe Dr. Thank you for informing us about this streetlight outage. The given address and information has been reported to the power company for repair. Please let us know if it has not been repaired within next 3-5 business days. Streetlight comes on but goes out at 765 Danbridge Wy. Thank you for informing us about this streetlight outage. The given address and information has been reported to Sawnee EMC for repair. Please let us know if it has not been repaired within next 3-5 business days. The stormwater drain at 405 Waverly Hall Drive, accepting runoff from a significant part of Waverly Hall Drive, a cul-de-sac, and from backyard drainage on other side of street, is causing significant damage to my property, where it flows into the protected waterway in the backyard. With the recent rains - the problem has become extremely dangerous - with the washout now being approximately 10 feet wide, and about 40 feet long, and eroding away part of the landscaped backyard. The cause of the issue is a 24 inch culvert coming off the street, that is dumped out approximately 100 feet off the street, and 130 feet from the creek. 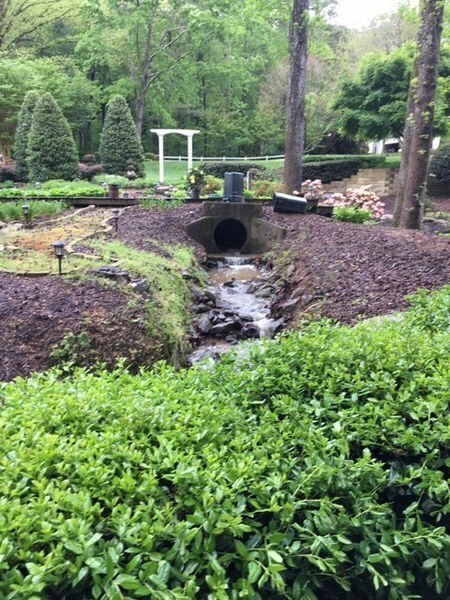 While the homeowner has attempted to channel the flow, as well as exercise some level of erosion control, the homeowner can not be expected to manage a multi-thousand gallon per minute outflow of water that fills the pipe to full capacity. Today is not the first time there has been an issue. In the past the extensive flow has even jumped the banks of the channel that has created, and flowed directly across the backyard to the creek. But the more it has eroded and deepened, it now does not flood across the backyard, but rather is washing away a tens of cubic yards of soil into a protected waterway. I realize Roswell states that all waterflow downstream of the culvert is the responsibility of the homeowner, but I believe in this case, the volume of water is too extensive for homeowner management. The first issue is the large length of road and area the pipe is being asked to handle, and may require re-engineering by the city so the outflow is more reasonable and properly handled. Second, because the ending point of the outflow from the culvert (approximately 130 feet away) is in a protected waterway, the Fulton County Protected Stream regulations prohibit the homeowner from taking any action which disturb the soil, grade, etc., within 25 feet of the protected waterway. I respectfully request the city to inspect, with the homeowner present. Please feel free to call me at 425-205-1854 to set up a time at your earliest convenience. Please bring back the flashing yellow arrow for eastbound traffic to turn into Terramont. Thank you for contacting the City of Roswell Department of Transportation. Due to the accident data over the past year this Traffic Signal on HBR was converted back to protected left-turn during the hours of 6AM to 9PM. This decision was made by GDOT and RDOT due to safety concerns and the current accident trend analysis for the left turning movements. Thanks for your response & I understand the safety concern. Maybe sending traffic enforcement to monitor for red light runners would also help make it safer. Photo is from this morning, but it happens frequently. Dog feces in excess located in front yard. Children cannot go near. Smell covers the entire area. Homeowner dismissive and refuses to clean up. Thank you for contacting Roswell Code Enforcement. Your request has been received, and a Code Enforcement Officer will be assigned to investigate. A Code Enforcement officer investigated this complaint, and issue a 7-Day Notice for the removal of all dog excrement, and yard maintenance. Also, to move trailer to rear yard to approved surface. Grass too long, lawn mower in front of garage door since last fall, fallen tree branches on ground, plants growing in gutters, property looks abandoned. Has been like this for years. Please help. A Code Enforcement officer investigated this complaint and observed violations present. These will be addressed with a Certified Letter of Violation to the property owner. what does "Mark Products" mean on the watch area map mean?